Are You Properly Maintaining Your Wood Fence? Wood fences are some of the most beautiful fences for commercial and residential properties, but they can quickly lose their luster if you don’t take proper care in maintaining them. Wood fences are some of the most beautiful fences for commercial and residential properties, but they can quickly lose their luster if you don’t take proper care in maintaining them. Improperly maintained wood fences are incredibly susceptible to rotting, insect infestations, and damage. Here are some of the best ways to protect your wood fence. Protecting wood from the elements is a great way to ensure that your wood fence will last for a long time. You can choose from paint, a semi-transparent stain, or a solid stain. Paints are available in a huge range of colors to accent your landscaping and personal style. Paints create a solid barrier between your wood fence and any outside elements. Of course, if the paint starts to chip off or peel in sections, the wood beneath will be vulnerable. Make sure to check the condition of the paint when you complete your quarterly outdoor maintenance. Staining is a very popular option for people who want to show off the beauty of their wood without leaving it susceptible to damage. Stains are actually made from the same ingredients as paints, just in different concentrations. Stains soak into the wood itself and totally fill the pores so that water cannot get into the wood, completely preventing any moisture problems. Semi-transparent stains have even less pigment and let the wood grain show through. Semi-transparent stains do not provide as much protection from the sun or moisture as a solid stain, however. If you have an older fence, choosing a solid stain is a better call. 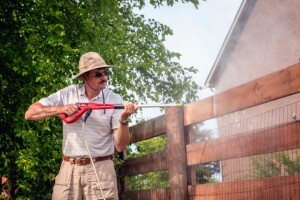 Semi-transparent stains work well for brand new wood fences that aren’t yet weathered or aged. Ready for the Wood Fence of Your Dreams?